I had a large bag of kale from our winter garden, along with a few other mixed greens, 2 small bags of parsnips, and 4 pomegranates in my refrigerator, so when I saw this recipe on Pinterest, I immediately wanted to try it. I put on a large pot of chicken noodle soup while I roasted the parsnips and prepped the other salad ingredients. It was absolutely delicious! And it looked like Christmas! This one’s going in the archives. The dressing recipe alone is worth saving! And it was the perfect accompaniment to the soup on this dreary winter day. Wash the parsnips and scrub if needed, no need to peel them. Slice lengthwise into pieces about 3 inches long and then cut those into quarters (or eights if the parsnips are big). Place them in a roasting pan with the 2 Tbsp olive oil and 2 Tbsp maple syrup and toss well. Roast them in a 375 F oven for about 35 to 40 minutes, or until tender inside and crispy golden on the outside. Remove from oven and allow to cool. Place all the salad dressing ingredients in a jar, screw on the lid, and shake vigorously. Cut away the stems from the kale leaves and discard them. Place the kale leaves on top of one another and shred finely. Place the shredded kale in a large salad bowl and toss with the vinaigrette. Let the kale rest for 30 minutes to absorb the dressing. Deseed the pomegranate. This video shows how to do it. Add the pomegranate seeds and the cooled roasted parsnip to your salad and toss. If you wish, garnish with toasted hazelnuts (simply place hazelnuts in a skillet on medium heat for about 5 minutes, stirring frequently so they don’t burn) and freshly grated parmesan. Heat olive oil in large skillet over medium high heat. Sauté onions and peppers with salt and pepper until almost translucent. Add garlic and cook for one more minute. Add ground chicken and cook for another 5 minutes, stirring constantly. Don’t worry about getting it fully cooked yet–it will keep cooking through to the end. Stir in sriracha, Worcestershire, and spices. Add water, quinoa, and kale, and bring to a boil. Reduce to simmer, cover, and cook for 10-15 minutes (see quinoa package cooking instructions for time length; if you have parmesan rinds available, add them during this step). Meanwhile, preheat oven to 425ºF and prep whole bell peppers by carefully cutting off (and reserving) pepper tops. Remove seeds and pith. You may need to remove a small portion of the bottom of the pepper so it stands upright, being careful not to cut through into the shell of the pepper. Stir stuffing till mixed evenly. Oil a medium size casserole dish and line with about 1-2 cups of the stuffing. Stuff peppers and place in stuffing bed in the casserole dish. Place pepper tops back in casserole dish as well. If there’s any remaining stuffing, add it to the casserole dish around the peppers to help them stand up. Drizzle with olive oil. Bake uncovered 15-20 minutes, until golden brown on top. Meanwhile, prepare Avocado Sauce (below). For serving, remove parmesan rinds, drizzle with Avocado Sauce, and top with freshly chopped cilantro leaves and freshly grated parmesan, if desired. Add all ingredients except olive oil and water into food processor (or high power blender) and blend till smooth. Slowly drizzle olive oil in till emulsified, then slowly pour water in until sauce reaches desired viscocity. Note: This dish is great to make the night before and reheats very well. On the second day (if there is any leftover stuffing), use as taco filling and top with chopped fresh tomatoes, sour cream, avocado sauce and fresh chopped cilantro. Busy day at work. Rolled out the Registration for our next big event: FX-TW 2013! FX-VB 2013 was great, but the Frontline Experience at the Wilds will have more sessions, more breakout sessions (including a special “Pastors’ Track”), and some amazing speakers! Come! Bring your friends! Bring your Young Adult class! Bring your pastors! Get excited about what God is doing through unconventional missions to unreached people groups! Come…and then go! Hope to see you all there! I cannot wait for the FX-TW conference on September 27-28th! More info at www.frontlineexperience.org! Still subbing the paper route and working full-time. So very tired! I am not a morning person–or at least not a “middle-of-the-night” person. Fantastic day of God-filled conversations! So thankful for refreshment of faithful friends and family! Had a friend stop by the office for a cup of coffee and conversation about her future plans as she headed to a new city to pursue further education, find a new job, and get plugged into a church in the city! After work, had dinner with my dear friend Faith and discussed contentment and the will of God–based on recent sermons we’ve heard, conversations we’ve had, and books we’ve read. Finally, just before bed, I was able to talk on the phone with my grandma who turned 90 today! She is one of the most amazing people I have ever known–and she gives all the glory to Jesus!! So thankful for a godly heritage! Happy Birthday, Grandma T! Went to bed refreshed and encouraged, despite the exhaustion. Last few days of the paper route. Few things are as enjoyable on a quiet afternoon as dark chocolate, almonds, and coffee. Celebrated the last paper route on Thursday morning with breakfast at Panera (part of their “hidden menu”). It was two eggs, thinly sliced steak, sliced tomatoes, and avocado with a cup of their Dark Roast (definitely needed that). Mom made it into town on Thursday. So, on Friday night, we had my mom, my sister and brother-in-law and the nephews over for homemade pizza and kale salad. They loved it! And it’s the last time I’ll get to say “my sister and the boys”–she’s due to have a baby girl any day now! Welcomed Kassia Jane to the world on Saturday morning! Mom and baby doing well…and she is precious!! Spent the day with my mom and the nephews at our house, while Bryan (“Uncle B”) and his dad (“Uncle B’s dad…Papa”) worked on the back room project (the outside walls are officially up and it is looking like an actual room!). Finally made it up to the hospital for the boys to meet their little sister around 4p.m. on Saturday, and as soon as we walked in, little Mark got sick. Poor kid. Needless to say, the visit was cut short. Fortunately, it didn’t last long…whatever it was. Sunday night, after several busy, busy weeks, we decided to do date night at the new Tupelo Honey Cafe in downtown Greenville tonight. Fantastic burgers and fries–and we sat where we could watch the kitchen in action! Everything looked delicious! We’ll be back! And “one of those days” it was, indeed! But it was all worth it. By the end of the week, all of our new English teachers’ paperwork was complete and their flights ‬were booked to head to China next month! There are still a few more details to complete to get them ready, but we are praising God for how He is working on their behalf! This is a very exciting time! On top of that, our test site for the new database system is up (training starts on Monday)! Dad arrived Friday morning. Friday night, Michelle decided to rest at home with the baby, while Alan and the boys, along with my folks, came over for a spaghetti dinner! It really hit the spot! Plans for today involve laundry (for us and my sister), hanging out with family, Bryan helping with a banquet at church, and rest. Definitely rest! 1. Cook thick-sliced bacon over medium high heat until crisp. Remove bacon from pan and pat dry with paper towels. Crumble bacon. Let bacon grease cool slightly (pour 3 Tbsp. grease into a glass bowl to help it cool faster, if desired–just don’t let it burn). 2. Prepare kale. I buy the pre-washed, pre-chopped bag of kale, but if you buy fresh, whole kale from your grocery store or farmers’ market, wash thoroughly (I recommend triple washing to remove all the grit), pat (or spin) dry, remove stems and chop as finely as desired. Set aside. 4. Toss kale in dressing. Make sure leaves are evenly coated with dressing (use your hands–just don’t burn yourself). Then add crumbled bacon, goat cheese, cranberries and almonds and toss. 5. Serve as an appetizer, a side salad, or as dip with crackers. The combination of crunchy and creamy, tangy and sweet is fantastic! This is definitely a new family favorite! Bon Appetit! Note: You could also add 2 Tbsp. of finely chopped red onions or scallions for a nice touch. As an alternative, I made some this week and switched out the cranberries for some finely chopped sun-dried tomatoes, added juice from half a lemon to the dressing, and used plain goat cheese, along with the almonds and crumbled bacon, and it was a big hit! So whether you go savory or sweet, bon appetit! 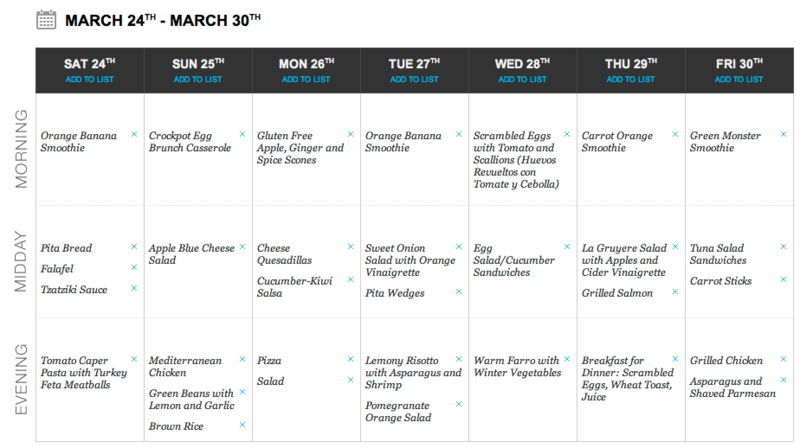 A Meal Plan from My Sister! 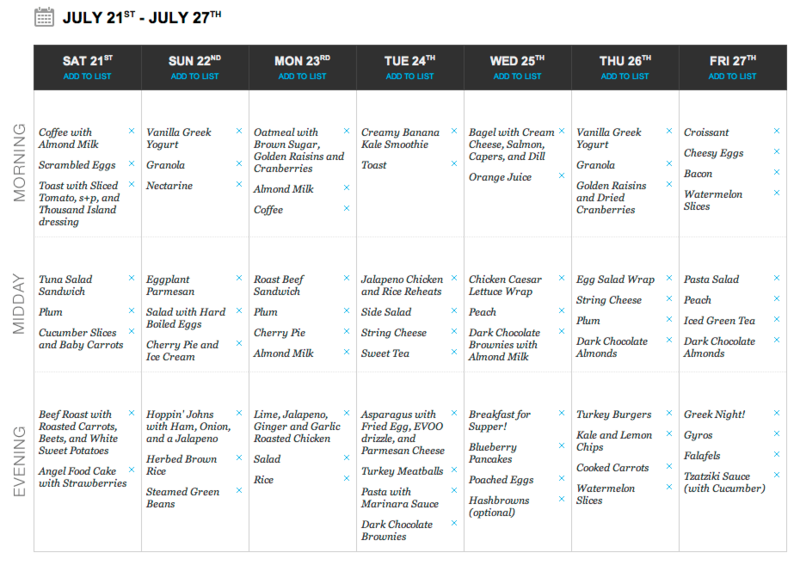 This week’s meal plan is brought to you by my twin sister Michelle from A Fruitful Vine and Olive Shoots – local mom and author. I had some unexpected responsibilities come up this week, and she graciously agreed to help me out! Enjoy! This Week’s Basket from Milk and Honey Organics Included Green Beans, Lacinato Kale, Green Leaf Lettuce, Nectarines, Burgundy Red Plums, Dark Sweet Cherries, Parisi Farms’ Heirloom/Carolina Gold Tomatoes, Parisi Farms’ Watermelon, Bio-way Farm’s Slicing Cucumbers, Parisi Farms’ Eggplant Medley, Parisi Farms’ White Sweet Potato, and Parisi Farms’ Jalapeno Peppers. The rest can be found on M&H’s Recipes Archive page, or substituted for your family favorite. Thanks, Michelle! My dark sweet cherries never make it into a pie; they remind me too much of my European mission trip and roadside stands, and I end up just eating them in handfuls. 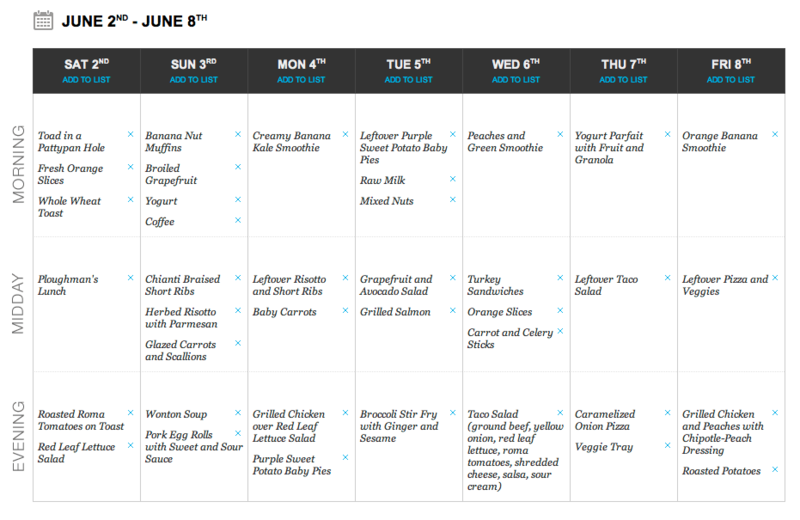 Happy as a June Bug on a Summer Day with our Basket and Weekly Meal Plan! This Week’s Basket from M&H Included Jumbo Yellow Onions, Purple Garlic (it’s hiding in the basket), Red Leaf Lettuce, Star Ruby Grapefruit, Valencia Oranges, South Carolina Peaches, Roma Tomatoes, Bananas, Local Broccoli, Parisi Kale, Parisi Patty Pan Squash and Parisi Purple Sweet Potatoes. Rest of Recipes can be found on the Recipes Archive page of the blog. 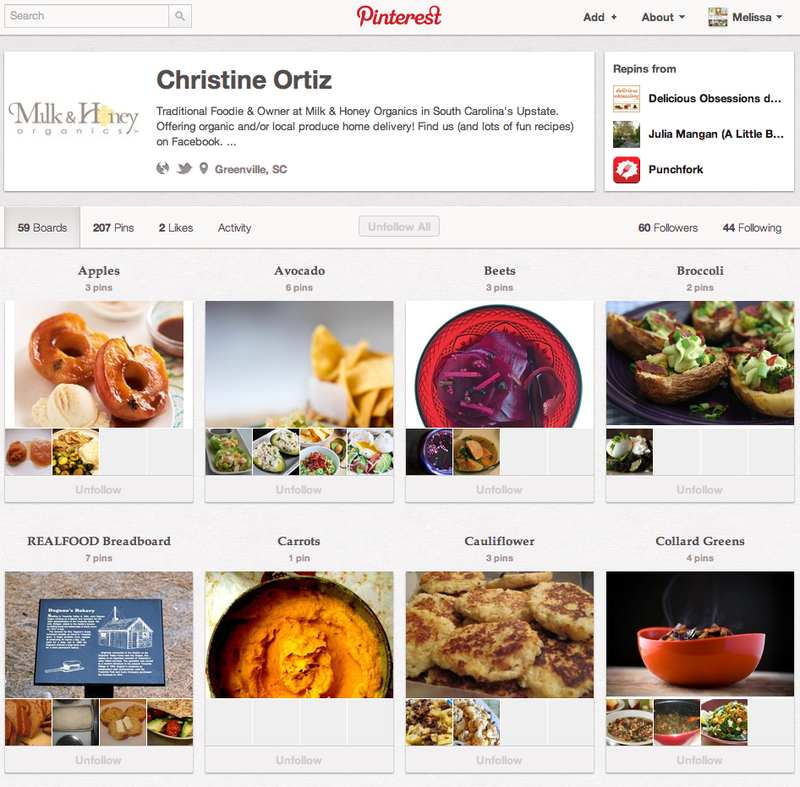 And for even more ideas on what to do with your basket, check out M&H owner Christine’s “MyMilknHoney” Pinterest account here…with a Sneak Peak below (boards separated by produce type!). Happy as a June Bug on a Summer Day! Enjoy your baskets! We were out of town for my brother’s wedding in New York last week (hence, no meal plan on the blog). It was fun, but we are glad to be home. This Week’s Basket from Milk and Honey Organics Included Parisi Farms Curly Kale, Parisi Farms Red/White Creamy Potatoes, Tomatoes from Kem at Chef’s Greenhouse, Texas Jumbo Sweet Onions, Red D’Anjou Pears, Star Ruby Red Grapefruit, Kiwifruit, Bananas (oops, they didn’t make it into the picture), Carrots, Broccoli, Crimini Mushrooms and Baby Spinach. 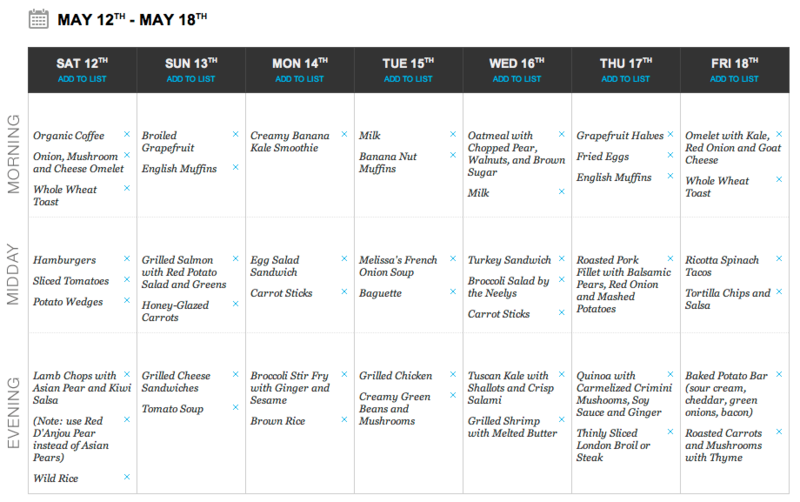 Note: All recipes from this week’s menu can be found on M&H’s blog’s Recipes Archive page. Melt butter in stockpot over medium heat. Add onions, shallot, garlic, olive oil, carrots, salt, pepper, and herbs. Sauté for about 5 minutes, until onions are translucent, stirring regularly. Add tomatoes, potato, and kale and cook 3-5 minutes, until kale begins to wilt. Cover with water, just to the top of the vegetables, add bouillon, and bring to a boil over medium high heat. Reduce heat to medium low, add beans with liquid, and simmer for 10-15 minutes, until potatoes and carrots are tender but still firm. Taste and add salt and pepper to taste. Serve hot with a hearty bread. This Week’s Basket from Milk and Honey Organics Included: Hurricane Creek Farms‘ Romaine Lettuce, Parisi Farms‘ Kale, Local Chef’s Greenhouse Tomatoes (Wait until you see these Beautiful Italian tomatoes!! 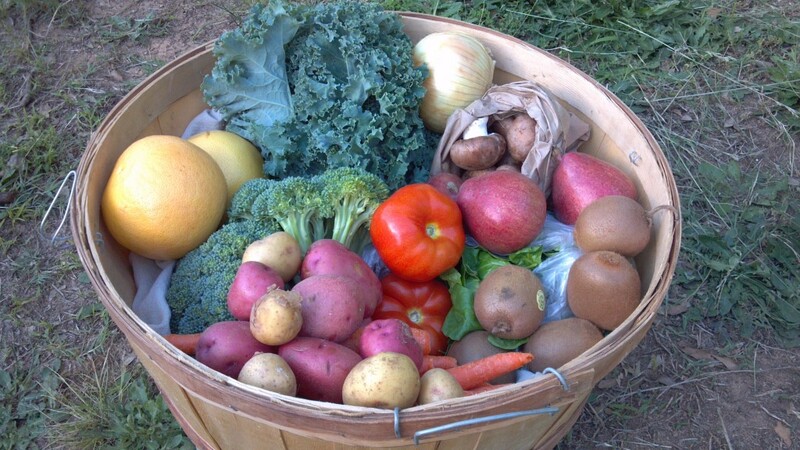 ), Watsonia Farms’ Green Cabbage, Covington (NC) Sweet Potatoes, Lemons, Bananas, Red Onions, Shallots, and Cauliflower (Not shown, but in most baskets: Valencia Oranges, Kiwi, and Ataulfo Mangos; we received extra of other items instead). 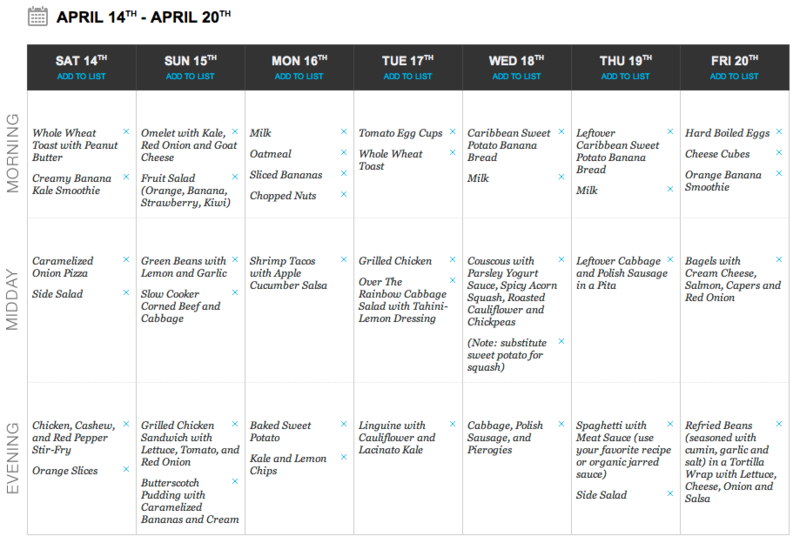 The rest of the recipes from the meal plan can be found on the M&H Blog’s Recipes Archive page. Bon Appetit! Other Recipes available on the Recipes Archive Page of this blog.